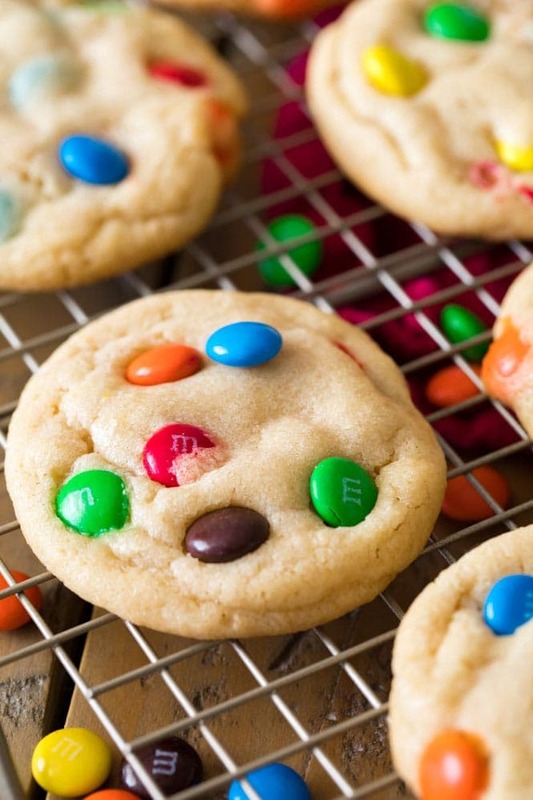 These soft and chewy M&M Cookies are absolutely loaded with colorful candy pieces! 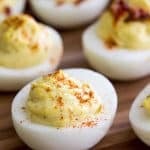 Easy to make with no mixer required, this a great recipe to make with the kids! My M&M Cookie Recipe includes a brief step-by-step video at the bottom of the post! 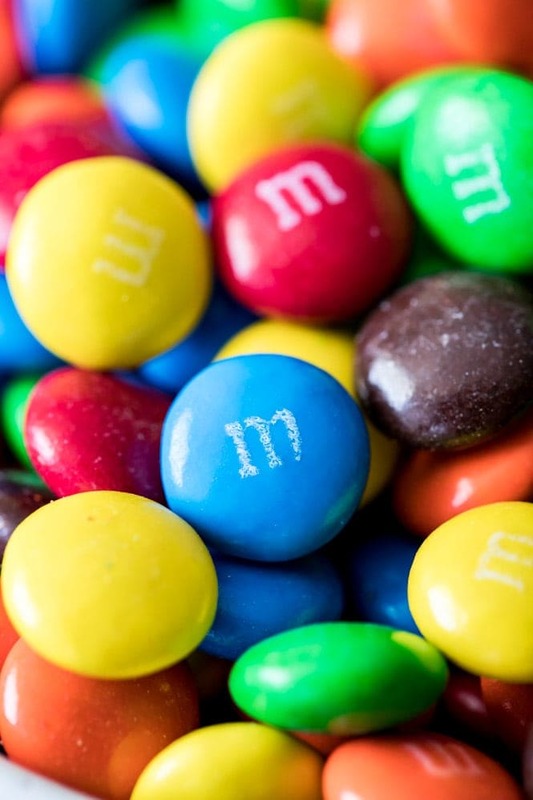 Do you realize how many different flavors of M&Ms there are out there? Just curious, because until the other day when Zach came home from the grocery store with about 10 different colored M&M bags (because there’s obviously not enough sugar in my house already 😉), I had no idea. I made these M&M Cookies with plain milk chocolate M&Ms, but now I’m looking forward to trying them with different flavors (so far, from trying them outside of a cookie, Caramel is a clear winner, White Chocolate is too sweet, and even though I was super resistant to trying Strawberry Nut it was surprisingly good). 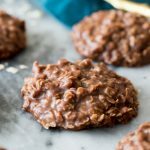 Regardless of which variety of chocolate you choose to use, I think you’re going to love this easy, no-mixer required M&M Cookie Recipe. Let’s get started. 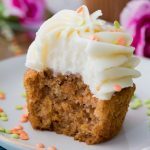 Why Do We Use Melted Butter Instead of Softened Butter? 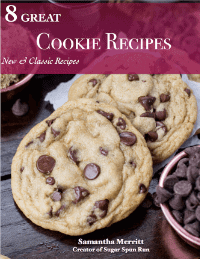 Many cookie recipes call for softened butter and the ingredients direct you to cream your butter and sugars together. 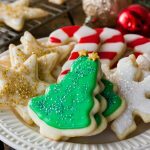 There’s nothing wrong with this technique, but I’ve found time and time again that creaming butter and sugar leads to cakier cookies, while using melted butter yields not only a chewier, softer cookie, but one that’s more buttery/more flavorful as well. 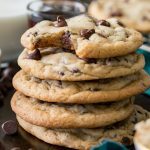 Ever since first using this technique with my (“worst”) chocolate chip cookie recipe it’s become a default for most of the cookies that I share. There are some drawbacks to using melted butter. 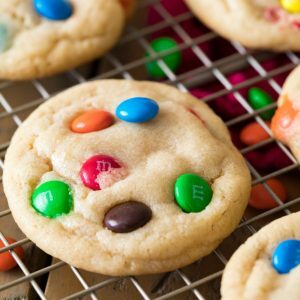 Usually cookie dough made with melted butter requires chilling (as this M&M Cookie recipe does) to keep the cookies from spreading to much, but I’ve found the taste to be worth any extra time. As I’ve also noted in this recipe and others, it’s really important that you not only melt your butter, but also let it cool back down to near room temperature. If you add your sugar while the butter is too hot, you can actually melt the sugar and end up with runny cookie dough that will never hold its shape in the oven, no matter how long you chill it. Want to nerd-out about butter some more? 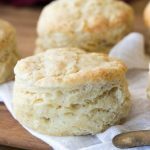 Read why I use unsalted instead of salted butter here. My video for these M&M Cookies is at the bottom of the recipe! 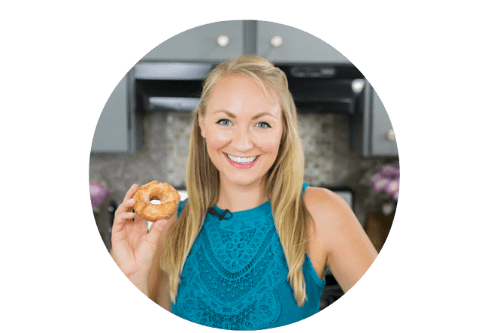 If you enjoy watching my recipe videos, please consider subscribing to my YouTube channel. 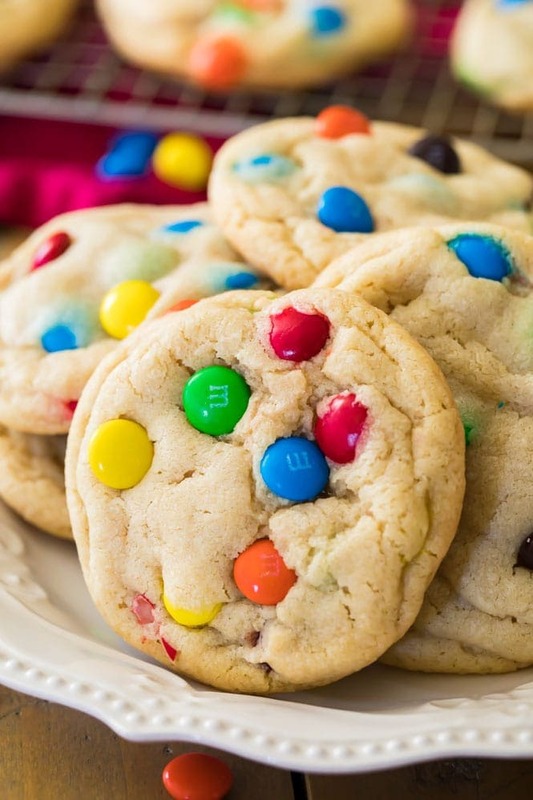 These soft and chewy M&M Cookies are absolutely loaded with colorful candy pieces! These cookies are easy to make and utterly addictive. Combine your melted (and cooled) butter and sugars in a large bowl and stir until well-combined. Add egg, egg yolk, and vanilla extract and stir until combined. Once oven has preheated, remove your chilled cookie dough from the freezer and roll dough into approximately 2-Tablespoon-sized scoops. Roll gently to form a ball and place on prepared cookie sheet (space cookies at least 2" apart). Bake on 350F (175C) for 10-11 minutes, centers of the cookies may still seem slightly underbaked -- allow cookies to cool completely on cookie sheet to finish cooking there, this will help keep them nice and soft. These cookies are the.best.ever!! 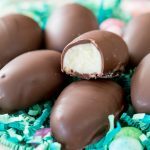 We can’t use M&Ms because of a severe peanut allergy, and I couldn’t find my usual substitutes of hersheyettes or sixlets, so I used some chopped up Hershey’s candy coated chocolate eggs. They were amazing! My 6 year old even said, “The chocolate candies are good, but the dough is the best you’ve ever made!” And that’s saying a lot since with our food allergies I bake nearly all of our treats from scratch. A definite winner! And I just admit that while it took some work to stir, I kind of loved not dragging the stand mixer out. Thanks! This recipe resulted in some of the best M&M cookies I’ve ever had. My family enjoyed them. 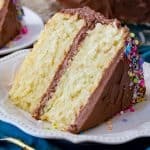 Thanks for sharing the recipe!!! These. Are. My. Weakness. Best cookie of all time!!! I am convinced the melted butter is the secret! Never going back to softened butter! Nope, no problem freezing! 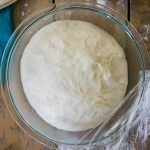 I chill the dough, scoop them, then wrap individually in plastic wrap (to keep the dough balls from sticking together) and then place in a freezer bag and freeze. Just baked a frozen batch last week to take to a party and they came out great, you just will probably have to bake a few minutes longer. Hi, can i prepare this batter, make the cookie balls and freeze them? Will they turn out well? Wanted to pre-prepare them for a party on the weekend. Omg you replied!!! Thank you so much dear! But, it would be next to impossible to individually cling wrap each one of them..as I plan to make around 50 of these. Any tips? Can i make the balls and let them freeze on a tray and then after they’ve solidified put them in a zip lock bag before popping them in the freezer? Is that possible? I freeze cookies all the time by putting the cookie balls on a baking sheet in the freezer. Wait until they’re frozen and throw them in a gallon bag. When you’re ready to eat them put them on a baking sheet right away to thaw, smash them with your palm when they’re thawed, and then bake them. I freeze lots of things this way – bacon grease, tomato paste, pumpkin portions for my dog, etc. These are real good! I did not melt the butter, instead I softened it and didn’t chill the dough. They still turned out incredible!! They dwindled too quickly! Thanks again, Sam! For how long can I keep the cookie dough in the fridge before baking the cookies? Thanks so much, Sam! 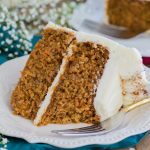 My family thinks I am an amazing baker because of you! Your recipes are always the best. Thanks so much for teaching me. Hi Melissa! 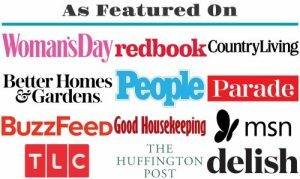 All of my recipes are for a bake setting! 😃😃 I myself am not very familiar with the convection setting. 😃 Enjoy!